This is merely me, sharing my own personal research since I got so confused about these two and because I use it - sometimes. LRT stands for light rail transit. On the other hand, MRT stands for mass rapid transit. The thing that got me so confused is their route. Apparently, I got confused due to LRT extension work and the newly developed MRT. I thought that the new stations for LRT were the MRT. There are totally different! As I have alway know, LRT consist of Ampang Line and Kelana Jaya Line and have just finished extending their route last year. The old route for Kelana Jaya Line means from Gombak Station until Kelana Jaya Station while the old route for Ampang Line means from Ampang Station and breaks and Chan Sow Lin station where one of it go to Sentul Timur Station and the other one go to Sri Petaling Station. 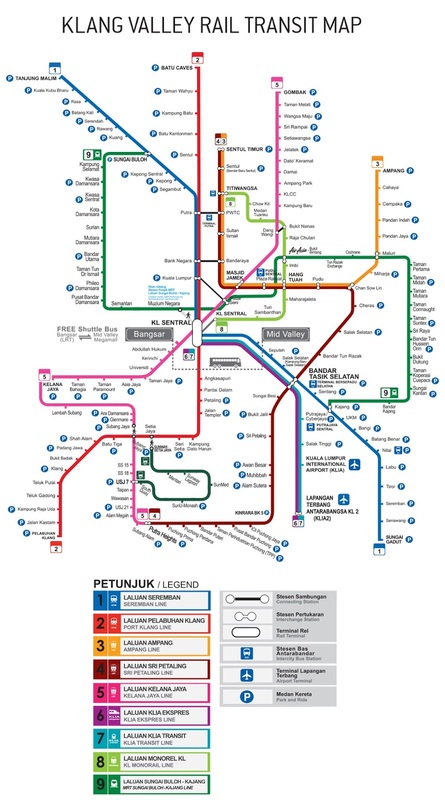 The best thing is after the extension work finished, both Ampang Line and Kelana Jaya Line is connected via Putra Heights Station. On the contrary, MRT is a new route made from Sungai Buloh station until Kajang Station. Both works for developing MRT and extending LRT was done in the same time so pardon my befuddled judgement. In conclusion, I just wanna say it is easy for me to hang out at Kuala Lumpur if I go and visit my relatives in Puchong due to the *extended* LRT route. MRT route won't be much needed for me. Lulz. Funnily, as I always find this image to help me plan my journey - I have never found the one who says "Yes, MRT line is now good to go". Until last two weeks when I actually saw Sungai Buloh Station up and running and just literally at awe. I was having some hard time locating this picture too! Pro tips - go to myrapid.com and choose "Plan Your Journey" so that you know which train to take and most importantly how much it gonna cost you. More pro tips - if you rarely went there but you didn't want the hassle of queuing and buying tokens, just use your MyKad as Touch N Go. It is easier since Touch N Go can also be used on KTM and if I'm not mistaken - it is cheaper by 10 or 20 cents than using tokens. By the way, I just realized it too that LRT and MRT was a project of Ministry of Finance - they were owned by the Malaysian government. Of course, it is lah kannnn. It's the freaking public transport. Yup, it can be really convenient. Having these near your place just opens up lots of possibilities. I still haven't experienced taking the MRT lol. I hope all the public transport especially the LRT and MRT system works conveniently to all as i am sure the government invested lots of money on it and hopefully the latest extension and newest MRT will reduce the traffic. Let's pray for that or else these trains will be such a waste.